Most people use prayer as a last resort, however when asking “Why must I pray?” prayer needs to be your first option for everything in life. 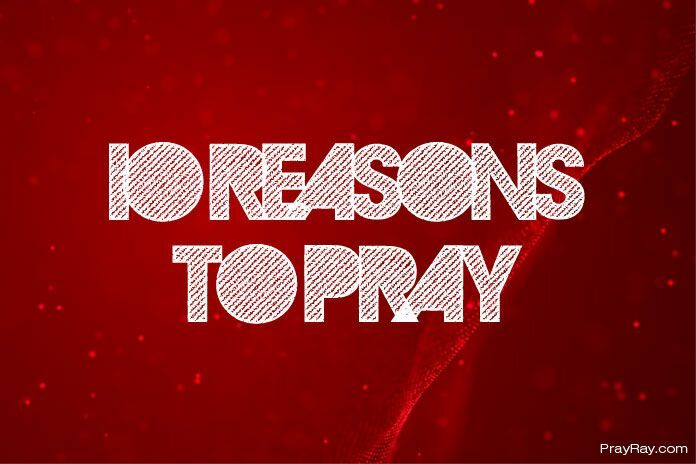 To answer your question “why must I pray?” here are 10 real reasons for prayer. Read carefully and find the answer. God’s will is something we all seek and many of us turn to prayer when facing a tough decision. Do you stick to your path or make a change and do something new? By drawing you closer to God and in intimate conversation with the source of all wisdom you will find answers, and the Will of God will become clear, and the choice is then yours to make. Peace is something we all seek in life, but storms blow, and a variety of life matters often mean peace does not seem to be available. In the moment of prayer, that few minutes with God, peace is automatically found. However, long-term peace in problems at home, at work or in your life, in general, is what we all seek. To ask yourself “how can I find peace?” really does answer your pending question “why must I pray?” Prayer words and peace is always found by putting God first. Peace is often not found because we are anxious about something, however Philippians 4:6-7 tell us not to be. Yes, prayer brings peace. The power of prayer is vast, and even medical experts have been left dumbfounded by miracle healings just because someone prayed and believed for healing. The bible it littered with healings, and all of these were a result of prayer. If you are sick, then prayer should be your first resort, not a doctor, James 5:15 reads: And the prayer offered in faith will make the sick person well; the Lord will raise them up. If they have sinned, they will be forgiven. Many of us are very selfish, thinking only of our own needs and desires while forgetting about the needs of others. Prayer makes you pause and sit still, and with regular prayer you soon have the needs and desires brought you and praying for them will become important. Matthew 26:41 says, “Watch and pray that you may not enter into temptation. The spirit indeed is willing, but the flesh is weak.” So prayer is a powerful weapon against temptations we face in our lives. Usually, we pray after we have yielded. But when we face temptations, our first option should be prayer, which can encourage us and give strength to overcome temptations. Pray more, and you will yield less. “Why must I go to the Gym?” and “Why must I pray?” have a similar answer. Both make you feel good about yourself, and in feeling good, you are happy. It has been proven that those who pray frequently have less stress and are generally happier. No one is perfect, and we and many others are in constant need of forgiveness. Trying to be the best Christian you can be is fraught with our mistakes and sins. Prayer brings us to the point of forgiveness. The Lord’s Prayer in Matthew 6:9–13 asks God to forgive us and then asks Him to forgive others. Forgiveness is a powerful force and just knowing we are forgiven often relieves a lot of worry and stress, forgiving others is also a powerful force, and through prayer, it is released. At the end of our tether or just feeling very down are times where the power of prayer is remarkable. Prayer through faith will give us hope, it doesn’t mean just because you asked God something that things will go your way. No, things will go God’s way and in his Will, and that alone is positive and hope is easily restored. Prayer is a powerful free tool for every Christian and when put to use miracles and favour will show up in your life because we understand who we are in Christ. Prayer is about loving and trusting God and through that alone prayer works in any situation. IF GOD IS ALL AROUND US, why do Christians go to Church on Sunday?